I’ve been having some video problem while playing Guild Wars 2, and after one recent episode of 4 crashes in 2 minutes, I decided to investigate. The symptom is: game freezes (for a second or two), minimizes so I can see my desktop for a split second, then comes back. Total time “frozen” is 5 or 6 seconds, and most of the time I’m fine in-game. However, I’ve had this happen mid-fight (I come back to a character with damaged armor), I’ve had this happen as I was running in the vicinity of a precipice, etc. Sometimes the game crashes out entirely and I have to restart. Unfortunately, I’m too familiar with this dialog. I’ve tried upgrading to the latest video driver, but it still happens. The next thing I’ll try is reducing every graphics option, hoping that a higher setting is triggering the problem. The note about the video driver recovering really means “TDR thought the system froze so it terminated and restarted the graphics driver”. There wasn’t too much info to glean, so I dug a bit deeper, and located the minidumps these crashes create. I found them in the c:\windows\LiveKernelReports\WATCHDOG directory, and counted them up. There were 113 of them. Yes, 113. One hundred thirteeen, over the last month I’ve been playing GW2. According to /age in game, I’ve played a total of 90 hours across all characters. So I’m averaging a video driver crash/restart every ~48 minutes. Not too frequent, but enough to drive me a little nuts. Now, to decipher what the minidumps contain, I started up a debugger. I used windbg, a simple and free yet functional/powerful debugger. It used to be directly downloadable from Microsoft, but these days it comes bundled with another SDK or DDK. Arg1: fffffa8006131010, Optional pointer to internal TDR recovery context (TDR_RECOVERY_CONTEXT). Arg2: fffff8800f36e584, The pointer into responsible device driver module (e.g owner tag). 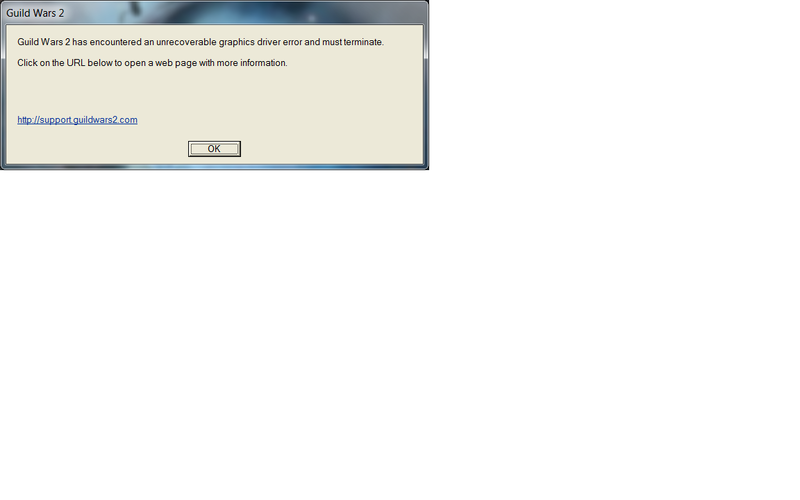 This just confirms the likely culprit is the driver for my graphics card, nvlddmkm.sys. The problem apparently occurs at offset 14b584 in the driver, and somebody would need source code or symbols to figure out what that is. There really isn’t much I can do at this point, other than maybe tracking down a way to report bugs to the vendor, and otherwise wait for an update and hope that fixes my issue. 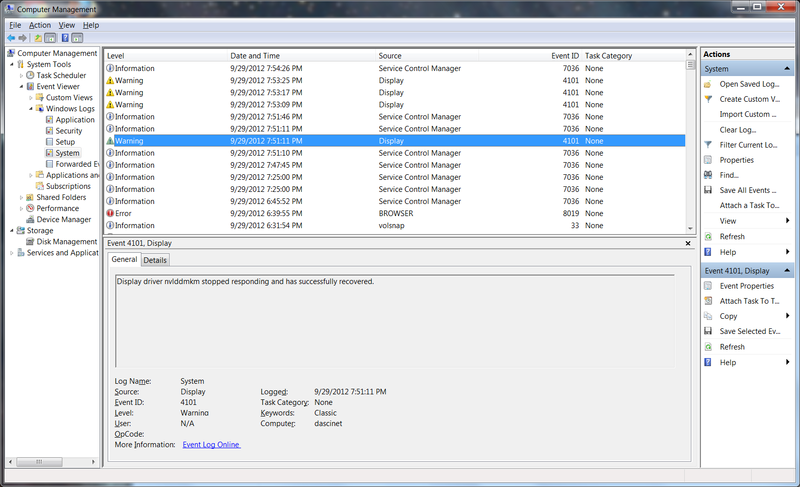 But at least I confirmed the problem, reported it to Microsoft (via the error reporting service)… who knows maybe enough reports will come in that somebody will be motivated to investigate. As far as playing, the timeout/crash/restart is very annoying, but other than several character deaths, it hasn’t impacted me too much. Typically I’m soloing or occasionally joining other guildies for a dungeon. If I were heavy into WvWvW I’d undoubtedly hate giving up a free kill every now and then due to ~5 seconds of client freezes. I’m going to lower every graphics option, hoping that reduces the chances of this happening. So I’ve been a slacker about updates lately… my original goal of 2 posts per week fell by the wayside. It’s that allocation of time thing to blame – time spent blogging could be spent playing. Anyway, I spent the last week dabbling in alts, and exploring zones. I’m finding exploration and completing zones fun. 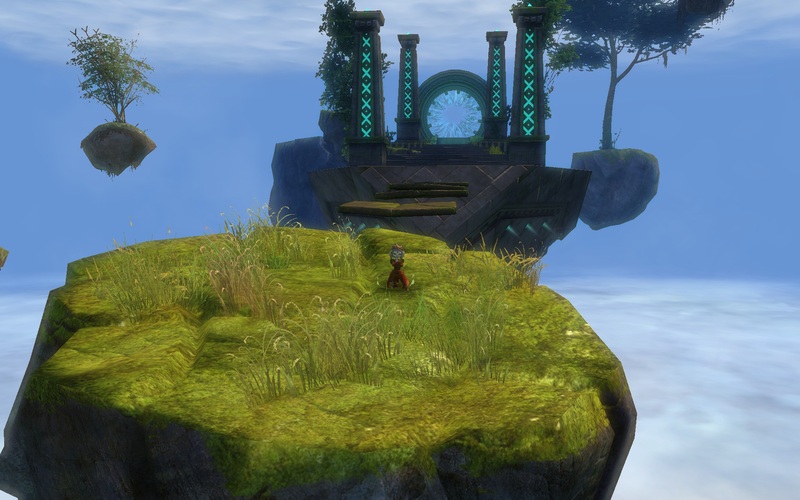 My character Aurora Tian is Asuran, so I’ve been working from west to east mostly. So far I’ve completed: Metrica Province, Caledon Forest, Brisban Wildlands, Queensdale, Kessex Hills, Gendarran Fields, Harathi Hinterlands, Snowden Drifts, Lornar’s Pass, and various cities: Rata Sum, The Grove, Divinity’s Reach, Lion’s Arch, and Hoelbrak. 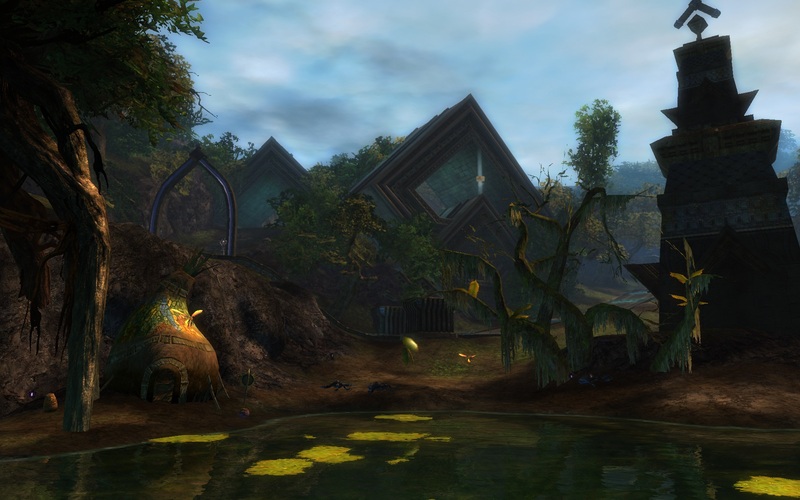 I have not stepped into any Charr/Ascalon area on Aurora, so far. I enjoy the variety of playing another character (or two…), seeing different skills and so on, so I invariably roll up some alts. I have a level 14 Guardian who isn’t quite clicking for some reason. You’d think a spellcasting melee char would provide a lot of differences over an elementalist, and that is correct, but it isn’t exciting so far. That might be simply that it gets better at higher levels, with a few more skills unlocked. My favorite char from GW was my ranger, but I just can’t get into playing them here. I figured it out – surprisingly the reason why is the pet. Yes, in GW I almost never used a pet; instead I was a Marksmanship, Expertise, or occasionally a Wilderness Survival trapper. But only once in a very great while was I a beast master. In GW, it was very viable to be a non-pet ranger, but not so much here. I’m lousy at controlling a pet, double checking they are attacking the right target. Heck, while tab selecting the next enemy I sometimes target an unaggroed foe – this problem is worse when I also have to make sure my pet isn’t wandering away to bring back more enemies. I settled on another Asuran – an engineer. I must prefer ranged attackers, and am looking forward to getting some of those turret skills. I tried a Charr engineer, but it seemed wrong to me to not play an Asuran engineer. I think this was mentioned on KTR, about how the Asuran culture in-game made them natural engineers. I hit another frustration point with the storyline, The Battle of Claw Island. I made it through, after dying once or twice. Others have noted the difficulty for storyline missions is off, they are tuned to sometimes be ridiculously hard. That is true here, but also the pacing is poorly done. This mission features a fair amount of running back and forth to talk to people, in between typical mission fights (large numbers). In the middle of the mission, the action stops while you have to fire a trebuchet at a ship, so there were a few minutes of clicking, aiming, and releasing a correct strength shot that hits the ship. Honestly, I’d cut that part out. After this, courtyard fighting, running to light a beacon and then running past all the mobs on the way there (get back to some friendly NPCs where you’d have a chance of help), and then an interminable fight in the courtyard where I wasn’t sure how to end it. Number of mobs killed? A certain amount of time had to pass? Kill all of a certain (but as far as I could tell non-identified) group? Some other event timer invisibly ticking down? I didn’t see a big boss monster… anyway it eventually ended and then there was a final fight to the ship portion. I just think this could be tightened up significantly: no trebuchet time waster in the middle, less back-and-forth, no beacon lighting, an easily identifiable timer showing how much is left “to do” in the courtyard fight, etc. Maybe I have a bad memory of it because my video driver crashed midway through, just after the beach rescue and initial courtyard fight, so I had to restart and do it again. So I would normally post about the fun time I’m having in GW2, but I’ve run up against basically the most miserable experience I’ve ever had playing MMO content ever. That would be the jumping puzzle where a mistake means falling to your death… and this puzzle is in a storyline mission. So unless I can do it, progress is halted on my main char. The mission is “Bad Blood”. 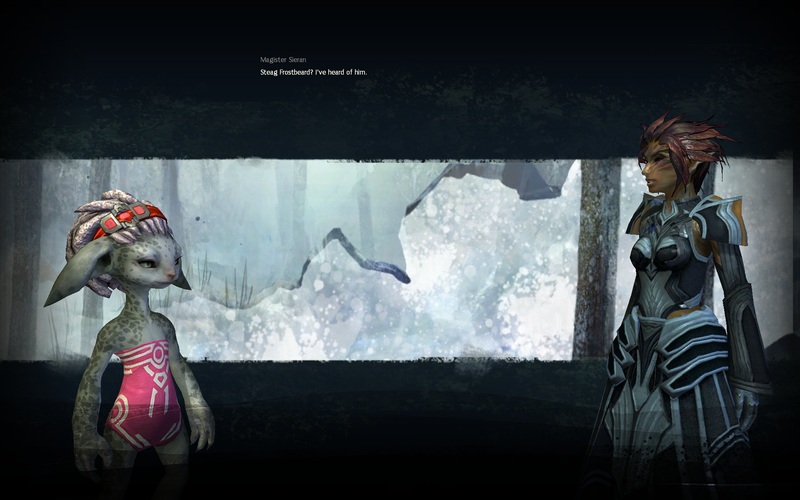 I’m not sure what forks are needed to get here, but my char is an Asuran that opted to join the Durmand Priory. 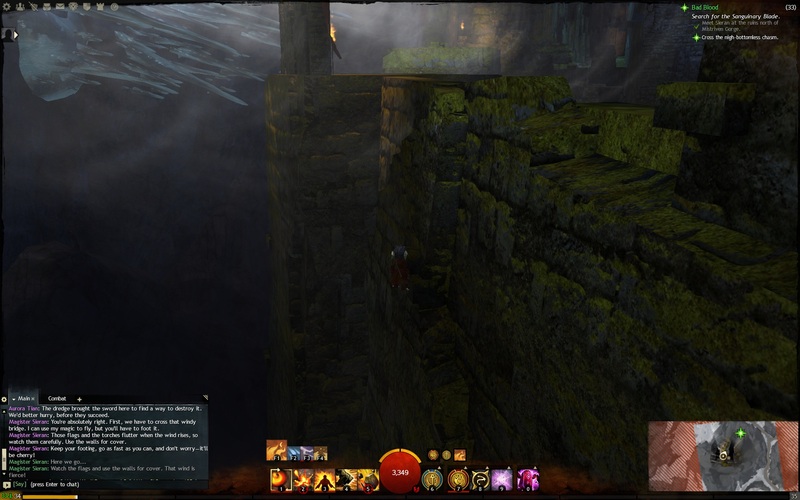 The mission starts with Magister Sieran flying to the other side of a chasm, and I’m left to time runs and jumps over a narrow ledge in order to continue. The puzzle seems similar to the optional jumping puzzle in Metrica province (which I gave up on by the way, because I couldn’t do that either) where the coast is NOT clear – gusts of wind blow intermittently and those generally mean a death fall. Not every gust kills you – for instance there is the useless ledge I fell onto one time. I tried to jump back up to the narrow ledge but guess what? Yeah, there didn’t seem to be a way back up so I died again. Plus it is hard to rotate the camera to look where you need to when you are flush up against a wall. Maybe there was a way back, but I found death at the bottom instead. I like the jumping puzzles (scenic vistas) but I’m really down on the insta-death mechanic added to them, on top of the “gust of wind” timing thing. Especially in a story mission. This is just stupid in every possible way to evaluate providing challenging content. So far I’ve died 10+ times trying to do this, and I’m about ready to abandon GW2 and go back to LoTRO. It’s just awful and really stupid design. Death #.. oh heck I’ve lost track. EDIT: I finally made it over, after so many deaths my armor was basically falling apart. Soon after was a hallway with spike traps, a fight against two enemies, and then the finale… by that point all my armor was broken and I finished up fighting in my undies. My frustration at this mission was maxed out and my GW2 morale almost negative. Gust of wind deaths just weren’t enough. At least Sieran could revive me. Final cutscene of my char in her undies, thank goodness those didn’t break as well. Now that I’m not spewing bile I can think about this more rationally. As I said, I do like the jumping puzzles (scenic vistas) but the mechanic there so far has been optional. I’ve been able to get the ones needed for zone completion – the aforementioned Metrica puzzle (which starts in the hidden cave/canyon) must be for a special reward because it isn’t one of the ones needed for 100% completion. I’m perfectly willing to concede my platforming skills might not be up for the toughest ones, and pass on undoubtedly awesome rewards. I don’t even mind trying repeatedly, because I mistimed a jump or wasn’t lined up or whatever. What sucked was that the penalty for a mistake was death: a plummet through the clouds to a big splat on the ground. 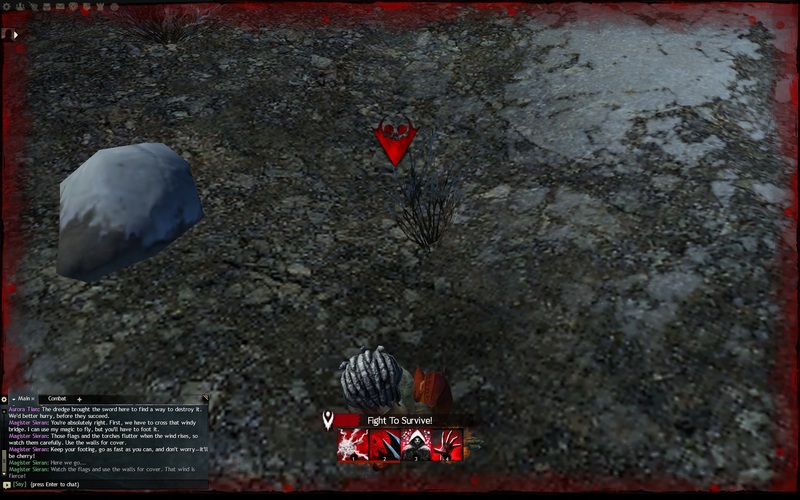 Then the game taunts you with the “downed state” animation for ~15 seconds, as you grasp for help that isn’t coming. I was solo, but even if I had a friend along (can you even do that for storyline mode?) what are they going to do – revive me by jumping into the bottomless pit?! Haha the joke is on both of us. The spike death was avoidable – the game thoughtfully draws overlapping circles where the spikes show up when triggered, so just avoid the middle where you are hit by both the left and the right traps. I rushed through the middle and found myself quickly impaled, but at least Seiran was there to revive me. Basically, I thought this mission could have had non-lethal falls and still retain 95% of the challenge and flavor of exploring a trap-filled dungeon. 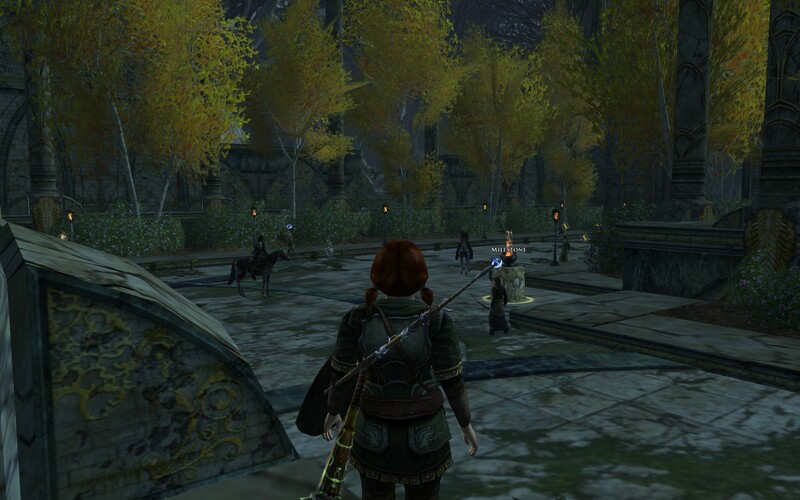 As fun as Guild Wars 2 is, I enjoy LoTRO too! So I logged back in and quested a bit in Thinglad, on Naerys my guardian. I think I’m done with the Thinglad quests as my next ones leads to the south, but I’ll probably switch over and advance the epic storyline a bit next time I play. The first thing I noticed was how slow combat seems in LoTRO compared to GW2. It isn’t a completely fair comparison, because the LoTRO guardian is a typical tank – high defense and low DPS – whereas my elementalist in GW2 is high DPS. Still, I kept thinking about this and finally decided to jot down some notes about combat. I got out a stopwatch, and kept track of how much health I lost during a fight (one on one), and how many skills I used. For this purpose, I counted a keystroke as a skill, and fought using a rotation I would have normally done. That is, I didn’t just rely on autoattack to kill the enemy, and used the best available skill off cooldown. Oh, and I always play Naerys as a sword and shield tank, or more accurately, a club and shield tank (to take advantage of the Hobbit +2% damage on clubs). These results may change in Overpower stance, but I’ve never used that so I don’t have a leveled Legendary weapon or decent legacies, etc. I think those are representative enough. My LoTRO guard is fairly survivable, leaving a one-on-one on-level combat against a regular foe with about 80% of the health (morale in LoTRO terms). An encounter like that is basically never fatal, or even close. In fact, I often try to draw over 2 enemies at the same time and rotate short-duration stuns and bleeds to make the most of those skills. The amount of time a fight takes and the number of skills used is interesting. Fights are over faster if I get lucky with a crits, but on average, it takes around half a minute and 15+ keystrokes. I think this is where LoTRO gets its reputation for slow combat… I’ll do some quick measurement in GW2, but I’m positive most fights there (one on one versus regular mobs) take about 5 seconds with 5 skills. On the other hand, the chance of death is much higher since my Asuran elementalist almost always leaves a fight with half health or lower! There is definitely not a 30 second slug-a-thon going on. Anyway, this isn’t criticism as I do enjoy LoTRO! It’s just a natural comparison to make after several days in GW2 and the much faster/riskier combat there. 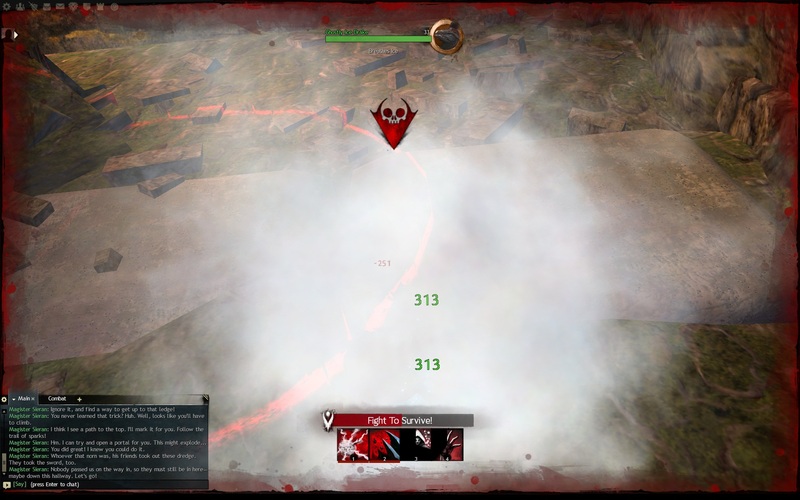 Another thing I miss from GW2 is the auto-selecting of resource nodes or enemies to loot. Too often I’ll click around in LoTRO for a few seconds before hitting the “del” key, which selects the nearest item, and then have to right-click to “use” it. The scenery is great in both games. Here is Naerys surveying the elf fortress of Thinglad. My Asuran elementalist (Aurora Tian) is now level 18, exploring in Brisban Wildlands. And the difficulty level is definitely higher than in Metrica Province! It is still playable, but I’ve also died several times getting jumped by 2-3 mobs and losing 80% of my health in 2 seconds. The saving grace is other players – by teaming up with them and moving as a big zerg ball, we collectively wipe out whatever threat we are facing, and of course revive each other. I couldn’t resist playing an alt, and after dabbling and rerolling various characters, I settled on a Human Guardian (Glyneth) who is now level 8. One pleasant surprise was finding out how many weapons a guardian can weild: two-handed weapons (greatsword, hammer); one-handed weapons (sword, mace) with shield or focus or torch; staves and scepters, which give the class a spell-caster feel.. the variety is great and it is a fun and sturdy class so far. My play style is to explore and shoot for 100% completion for maps on my ele.. except maybe not the jump puzzles. The last one in Metrica proved too difficult for me so I’ll come back to it another time. On my guard, I’ll focus on opening the hearts and waypoints (so I can move around the map faster). Since my ele is high enough level to start thinking about traits, I studied the wiki page before spending points. Though I play half my time attuned to Fire Magic, I opted to try out the Arcana trait line because I do switch between the other elements often. I’ll see how that goes, and if I miss the damage bonuses by not spending in Fire Magic, I can always switch later on.